Experience natural beauty and cultural immersion in the Amazon in Ecuador. 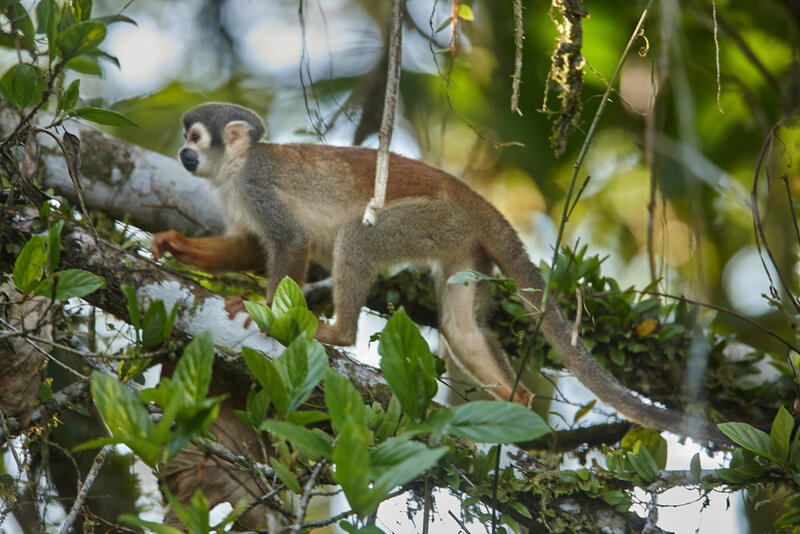 Monkeys & medicinal plants, cooking & crafting, wildlife and the local women's lodge are all on the agenda for this immersive Amazon experience. You can enjoy with any number - solo or a group - any time with Sunday-Friday travel dates. We also have 3, 5 and 10 day sustainable Galapagos tour options to extend your trip! Singles, groups and families welcome! See details below. Arrive at the Quito airport and meet your driver as you exit customs. You will be transferred to your local B&B about 15 minutes from the airport where you'll have time to settle in before dinner. You can explore the permaculture gardens on site with herbs, a fruit orchard, berries and vegetables and numerous patios and peaceful spots to relax in. Get up bright and early as we head back to the airport for our 35-min domestic flight to Coca where your community guide will meet you. You'll take a 2½ hour boat ride on the Napo River followed by a short walk and paddle canoe across the Challuacocha Lake to take you to the lodge. After lunch, you'll go on a medicinal plant walk with time for a siesta before dinner. Enjoy the evening talking with your guide and other travelers to learn more about Ecuador, the Amazon, and the surrounding Sani Islas community of about 650 people. After breakfast we'll take a canoe to the lodge’s 118 ft high observation tower to view life from the tree tops. More than 565 bird species have been registered, including the chestnut-fronted macaw, orange-winged parrots, and the wire tailed manakin, where they have a special viewing point for this rarely spotted bird. You'll likely also hear howler monkeys and might even see a sloth. After lunch and a siesta, you'll have additional wildlife viewing opportunities from the canoe or go on a night ride after dark to spot caimans. Today you’ll head out to the clay lick, an exposed cutoff of land where hundreds of parrots gather in the early morning to get salt and minerals from the rocks. Afterward, you’ll go on a 2-3 hour hike in the Yasuní national forest where you’ll learn about various plant species in the park biosphere and may see frogs, monkeys or possibly peccaries. Afterward we’ll go to the Sani Warmi lodge, where we’ll see their permaculture farm that includes plantains, cacao, and yucca as well as tilapia and turtles. After lunch you’ll have the opportunity to view their artisan craft shop where they make accessories, bowls, and bags from materials from the forest and learn how their work generates additional income for the community. Regroup at the lodge for a siesta, dinner and an optional night walk. After breakfast you’ll go on a special excursion back to the Sani Warmi lodge to spend a day of cultural exchange. You’ll participate in making plantain, yucca and fish for a traditional preparation called maito and also prepare chocolate & coffee grown on site. Your English, Spanish and Kichwa-speaking guide will translate so that you can chat and share with the women. After lunch you’ll learn traditional crafting methods using seeds & fibers from plants in the forest. The trip donation included in your cost goes directly to the Sani Warmi lodge to support their conservation and permaculture efforts, tourist program, and education facility. We’ll return to the lodge mid-afternoon with time for you to rest up before dinner. After your last breakfast at the lodge, you’ll backtrack down the Napo River to catch your flight back to Quito, arriving at 1:00 p.m. Schedule your flight home to leave after 5:00 p.m. or choose an additional add-on nights and take time to visit Quito (see add ons below). José Antonio Shiguango Alvarado is from the Kichwa community neighboring the Sani Islas along the Napo River, where our lodge is located. José started working in tourism in 2001, first as a boat driver then in the kitchen and as an assistant guide. After studying English and obtaining his official tourism license, José realized his dream of becoming a lead tour guide. José sees the Amazon as a paradise with incredible flora and fauna to learn from – the jungle is the school, and he is the professor. José loves to share his deep knowledge of the plants and animals of his home so that he can do what he loves and protect the forest for future generations. Ashley Blake is an avid traveler, cultural consultant and medicinal plant enthusiast with a background in tourism, entrepreneurship and project management. She is a fluent Spanish speaker and has worked and traveled in 35+ countries across Latin America, Asia, Europe, the Middle East and Africa including tours she has led in Nicaragua, Spain, Germany, China and Canada. Payments can be made either by 1) full payment on booking 2) $500 deposit on booking + payment schedule in registration. Payments will be invoiced via e-mail for credit card or Paypal payment online. To pay by check, please indicate on registration and make check payable to Traverse Journeys and send to PO Box 40516, Austin, TX 78704. Cancellations, less the deposit ($500) are refundable 90 days prior to trip start date. In case of cancellation, we can allow for last minute transfers for the rest of the trip for a $350 fee, which includes the re-purchase of the Quito-Coca airfare for the new participant. Please notify us immediately in the case of a transfer.